Mount Batur Sunrise Trekking and Natural Hot spring Is two combination tour between mount batur hiking with natural hotspring, we always try offer the best trips for our guests if trust their journey using our service. Mount Batur and Natural Hotspring are two very well-planned places for tourists, these two places are probably the best in Kintamani. The combination of this tour will be related to each other. First trip will be climbing Mount Batur, we need around 2 hours from the starting point to get the top of Mount Batur, Mount Batur is one of the best places to see the sunrise. But this place is slightly different, because it requires more energy to be able to do this activity. A lot of sweat that comes out of our body, so it will make the body feel tired and feel bad. After doing the climbing activity of mount batur, we prepare to clean the sweat out during climbing mount batur at Hotspring area. Hotsping is very closefrom starting point. 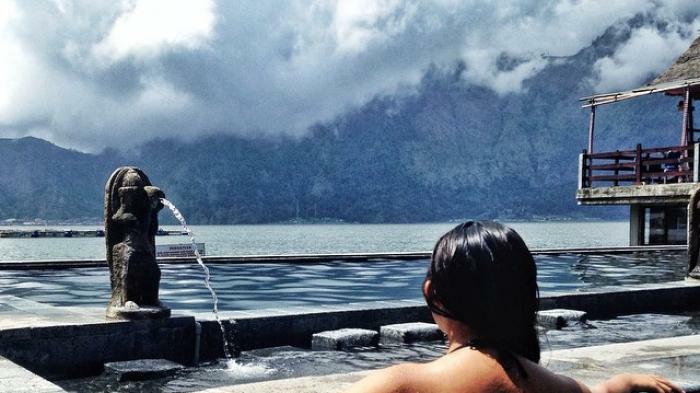 Natural hotspring in kintamani is one of the best hotspring in Bali. Hot Spring is a natural, incredible view, and its location on the side of Lake Batur will make you more relaxed after the climb. In this place have some available pools that you can try, and already available breakfast for who already hungry. Please book this tour with us, and get your best experience with this tour mount batur sunrise trekking with hospring. During the return trip you can see Traditional Bali Coffee Processing or Bali Agrotourism. Tropical place to see various plantations and see how to make Balinese coffee in very traditional process, and we get to sample Also of them as well as local herbal teas, coffees and the unusually processed Coffee Luwak, the most expensive coffee in the world. 06.15 AM: Arrival at the summit crater. 02.00 PM: Return arrival at your hotel. $70 USD PER PERSON (MINIMUM 2 PERSONS) Book Now!